Christmas Cookie # 1 for 2010 Holiday Baking. This is a very easy cookie dough to work with and since this was the first time I made this cookie I did a trial run. So who better to test my cookies than the staff at my husbands office! 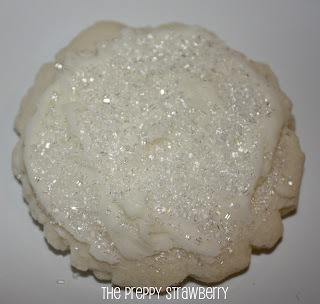 Cookie #1 was a hit so it will be added onto my holiday cookie list! 1) preheat oven to 350. Line baking sheets with parchment paper. 3) In medium bowl, combine flour and cornstarch. Gradually add to butter mixture until combined. Beat 1 tsp. peppermint extract. 4) Roll dough into 1 inch balls. Place on baking sheet and flatten gently with bottom of glass. Bake for 9-11 min or until edges are lightly browned. Let cool on pans for 2 min- remove and cool completely on wire racks. *I had to add about tablespoon of water to my frosting mix to get it smooth. You may have to adjust as needed.